This is a must read book for those studying the Old Testament. Alter is one of my favorite Old Testament scholars and this book will give you a lot of insight on how to read and understand the Old Testament by digging into how stories are told and meaning conveyed through narrative. This is a must have book and a must read book on the Old Testament. Alter has a series of books where he translates the Old Testament books and gives short insights on various points of the text. The insights are extremely useful and you can often catch the underlying Hebrew meaning better in his translation than you will in most modern English translations. His book on Genesis is the exact same content on Genesis included in this book. So don’t buy both! This is very inexpensive and a must read book. This book is a hybrid of a commentary and a theological textbook. He gives you principles on how to read Genesis and then works through the text in large chunks to help you understand how to apply what he taught in the beginning of the book. This book and the next one by Walton are solely about the creation account. These two books are invaluable in studying and understanding the opening chapters of Genesis. This book reveals some things from a Hebrew perspective that helps us wrap our minds around the genre of the creation account as well as its purpose. This is a very helpful book that can be picked up very inexpensively in older editions. They will give you the relevant background, historical and cultural information that sheds light on the biblical text. This is the “go to” Bible dictionary on Genesis-Deuteronomy. You will not regret purchasing this even though the price is a bit high. They utilized the foremost scholars in writing their articles. If you are just going to buy one commentary on Genesis, this is the one you want to buy. It is ideal for getting the deeper theological connections as well as giving the insights you will need to teach/preach through Genesis. I find Sarna’s “Understanding Genesis” to be a bit more fascinating but it is far less comprehensive, skipping a lot of the narrative of Genesis or just dealing with it too briefly. These are the OT counterpart to Wright’s NT for Everyone series and are written in a similar manner. Each section of the text starts off with the text, a personal story and then an explanation of the text. These are very helpful for getting the gist of the text. I typically use these toward the beginning of my study in order to wrap my mind around the big picture and then use other commentaries later in my study to get the finer details. This is my “go to” commentary set on the book of Genesis. He is thorough, uses enough Hebrew to get the job done without getting you too far out in the deep end like the JPS commentary or Wenham’s Word Biblical commentary. These are bit more expensive but worth every penny if you can afford it. This is a must read book on Genesis. Sarna doesn’t always take the conservative route so it may shake you up a bit but his views are worth considering and the connections he makes with the Hebrew texts and parallels with surrounding Ancient Near Eastern culture are fantastic. This can also be bought for under $5. This book requires a knowledge of Hebrew. The book opens/reads right to left except for the English text. So you open the book from the “back” and read toward the “front” and it is entirely based off of the Hebrew text. Unless you have a firm grasp on Hebrew this won’t help you much. 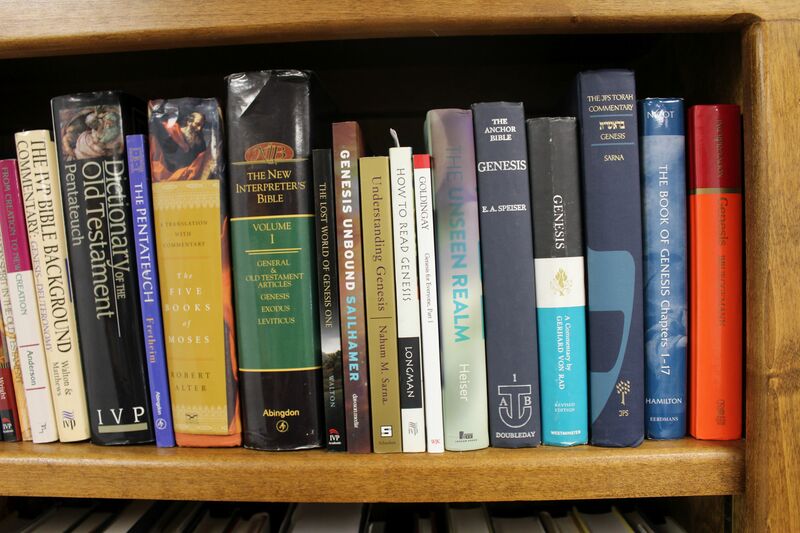 What is more, some of the most helpful material from Understanding Genesis is repeated in this work so just stick with that one and maybe add in Robert Alter’s Five Books of Moses to get easily as good of information for way less than half the price total. I haven’t used this book yet so I don’t have much to say about it. I like this series and I like von Rad so that is why I have it around. It is sure to be a bit dated at this point. I have used this sporadicaly. I like Walton’s work a lot and thought his book The Lost World of Genesis One was really helpful. These are generally inexpensive and helpful for teaching/preaching. It would be a toss up for me between Brueggemann and Walton for a teacher. Walton is probably a bit easier for the average Sunday morning teacher to pick up and run with than Brueggemann. I have these but use them very rarely. I go to this and the JPS commentary above when I have a specific question about the Hebrew text. These do require some knowledge of Hebrew to really be workable. John Willis’ commentary in the Sweet series deserves a mention. Very high quality work.